I am Penguin Bot! How May I Help You? An interactive chat bot service was recently introduced to the Youngstown State University website, granting students and faculty easier access to their university-related questions. 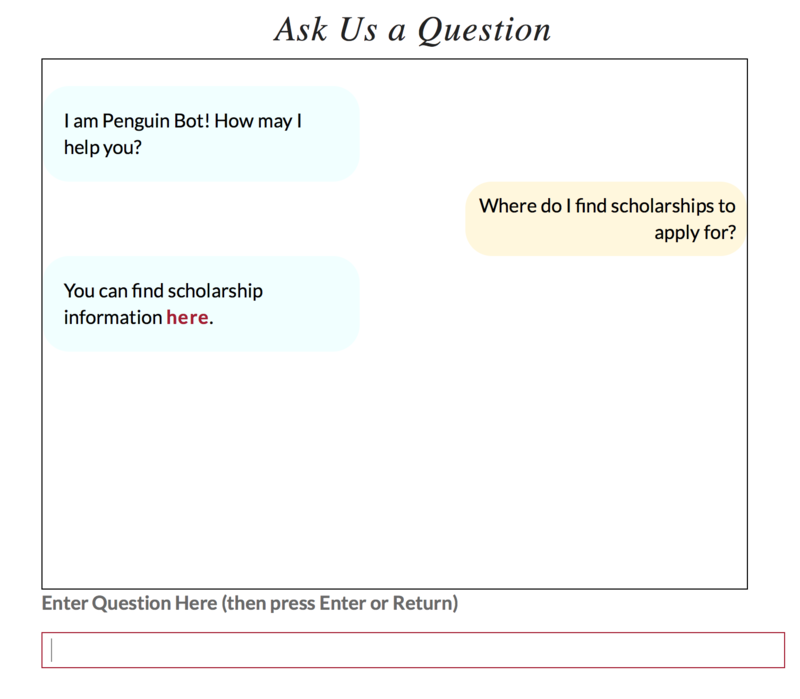 The Penguin Service Center launched Penguin Bot on its webpage in October. 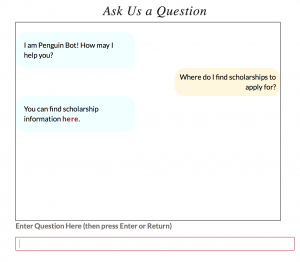 Carrie Stipanovich, the Penguin Service Center senior counselor, said the Penguin Bot allows students to get immediate answers to questions on their laptop or phone. The bot is designed to answer frequently asked questions at YSU regarding financial aid, registration, records and university bursar. Stipanovich said these questions can be answered by Penguin Service Center staff, but not everyone is able to visit the desk. For more complicated inquiries, Penguin Bot directs users where they can go to get their answers during open office hours. Links to campus maps, phone numbers and email addresses are provided when necessary as well. If the bot doesn’t know the answer to a question, Stipanovich said they will actively work to implement what users are looking for. “The more students use it, the smarter it gets,” she said. Jessica Gaskell, counselor at the Penguin Service Center, was assigned to research how other universities use chat bot services. Gaskell said she met with different companies for more information before the center decided on creating an in-home system. She hopes Penguin Bot will have a similar response over time. Maura Picciano, assistant director of the Penguin Service Center, said the students who know about the chat bot are using it daily. “We go in to train it daily and see the new questions, dozens of questions, that come up,” Picciano said. Picciano said the bot service is not an active tool on the YSU app, but it is something she is working to implement. Although Penguin Bot is a convenience after hours or on the weekends, the Penguin Service Center staff still encourages people on campus to call or visit the desk. Stipanovich said she always tells students the center is a good first stop when they don’t know where to go on campus. “We collaborate and work with a lot of different departments. We have a lot of information, so while we’re not specialized in academic advising and we can’t help you set up your curriculum, we can assist you in getting in contact with your academic advisor,” Stipanovich said. The center was previously called Student One Stop, but Picciano said the change was made six months ago to not limit their support to just students. “We assist faculty members, parents [and] people visiting the campus, so we really thought that The Penguin Service Center better encompassed what our services actually offer,” Picciano said. The Penguin Service Center is located on the second floor of Meshel Hall.